Rundown Drama sharing by Director Tang, demonstration by the artists of Tang Shu-wing Theatre Studio, and a short session of drama experience with audience. Tang Shu-wing studied in France during 1986-92 and obtained his Maîtrise Diplôme in Theatre Studies from Université de la Sorbonne Nouvelle. He received his training of acting in l’Ecole de la Belle de Mai and has worked as assistant director and actor in Théâtre de la Main d’Or. Entitled the Best Director award three times at the Hong Kong Drama Awards, Tang has directed over forty productions of drama, dance and opera. His works have been presented in many cities in the world - Titus Andronicus was invited to participate in the World Shakespeare Festival in the London Cultural Olympiad 2012 and became the first Cantonese production ever performed in this theatre, followed by an international tour of Titus Andronicus 2.0 across Europe and China. HKUAA Green and Culture Group is honoured to invite Mr. Tang Shu-wing, founder of Tang Shu-wing Studio and former Dean of the School of Drama of the Hong Kong Academy for Performing Arts, to be our guest speaker for the Drama Sharing Workshop on July 28, 2013 (Sunday). After completing the law degree in HKU and spending a few years in the law field, Director Tang finally decided to study theatre at the Université de la Sorbonne Nouvelle in France, and worked as assistant director and actor in Théâtre de la Main d’Or. Having directed over forty productions of drama, dance and opera, Tang is described by Parole Magazine of l’Alliance Française as “one of the most talented theatre directors of Hong Kong”, and entitled the Best Director award three times at the Hong Kong Drama Awards. 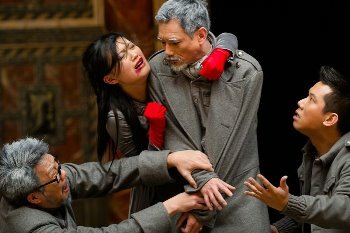 His works have been presented in many cities in the world - Titus Andronicus was invited to participate in the World Shakespeare Festival in the London Cultural Olympiad 2012 and became the first Cantonese production ever performed in this theatre. 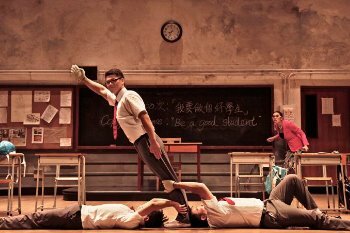 Detention, before embarking a 5-cities tour in China, was highly acclaimed by the U.K. media in the Edinburgh Festival Fringe 2012. Director Tang believes theatre is a way to experience life through self-discovery. He will share with us his views on drama and lead his artists of his Studio to perform some moves and tricks. Before the end of the workshop, participants will be able to experience drama with the artists. *Information and the pictures above are all retrieved from Tang Shu-wing Studio's website.